In Greece, women speak of mothering as "within the nature" of a woman. But this durable association of motherhood with femininity exists in tension with the highest incidence of abortion and one of the lowest fertility rates in Europe. In this setting, how do women think of themselves as proper individuals, mothers, and Greek citizens? 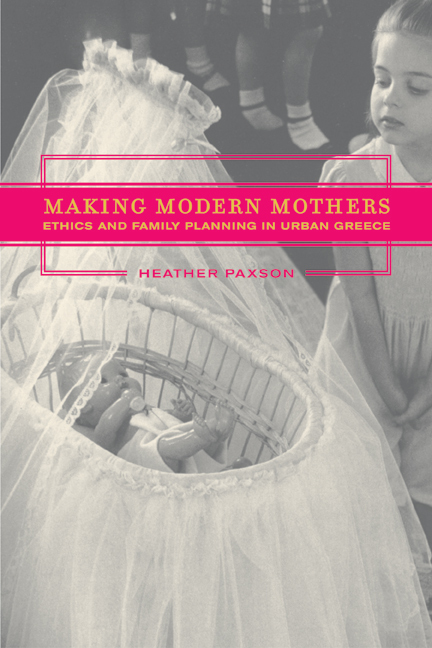 In this anthropological study of reproductive politics and ethics in Athens, Greece, Heather Paxson tracks the effects of increasing consumerism and imported biomedical family planning methods, showing how women's "nature" is being transformed to meet crosscutting claims of the contemporary world. Locating profound ambivalence in people's ethical evaluations of gender and fertility control, Paxson offers a far-reaching analysis of conflicting assumptions about what it takes to be a good mother and a good woman in modern Greece, where assertions of cultural tradition unfold against a backdrop of European Union integration, economic struggle, and national demographic anxiety over a falling birth rate. Heather Paxson is Lecturer in Anthropology at the Massachusetts Institute of Technology.